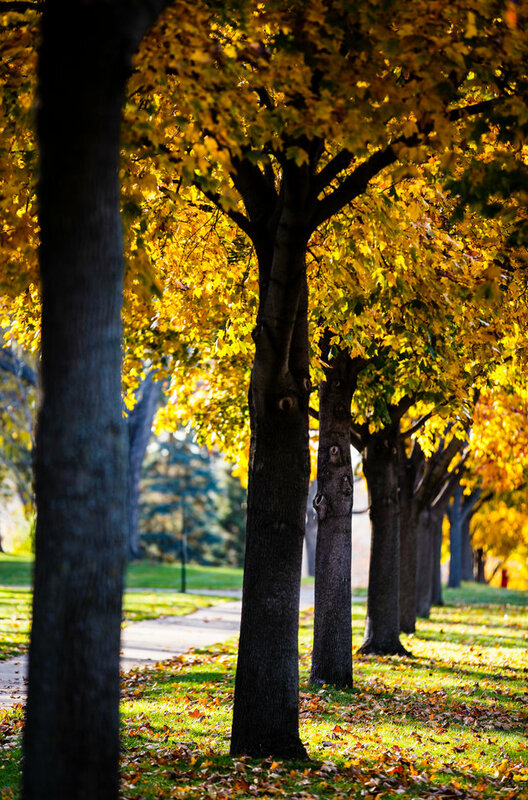 As the air grew colder and trees took their annual turn toward a dazzling array of oranges, yellows and reds, Minnesotans enjoyed the natural beauty their state has to offer again this fall. But what if, in years to come, those trees don’t find Minnesota to be a hospitable, happy home any longer? Sophomore Rachael Heier spent last summer researching how annual climate change may affect our native trees in a zone where winters are projected to be closer to that of current Wisconsin, and summers closer to that of current Kansas. Heier worked with biology associate professor Simon Emms, connecting with – and funded by a grant from – Great River Greening on the Fish Creek restoration project, which St. Thomas has helped with since 2011. For Heier, those practical activities centered on assisted colonization, where two types of saplings from the same species of white oak were planted “to see if we would transplant similar species that are adapted to warmer or colder climates,” Heier said. Heier and others counted and measured about 830 year-old plantings, which represent the baseline for measurements that will continue for another 10-15 years, she said. “It was cool to be on the front end and laying down the base groundwork, this really essential part,” Heier said. While Heier said she long has been interested in mitigating climate change, working on research like this helped her see the kind of impact smaller-scale projects can have toward bigger results.